Look, there it is. I went to visit Parvesh after we finished university; she was staying with relatives in Vancouver for a while before returning to Singapore. 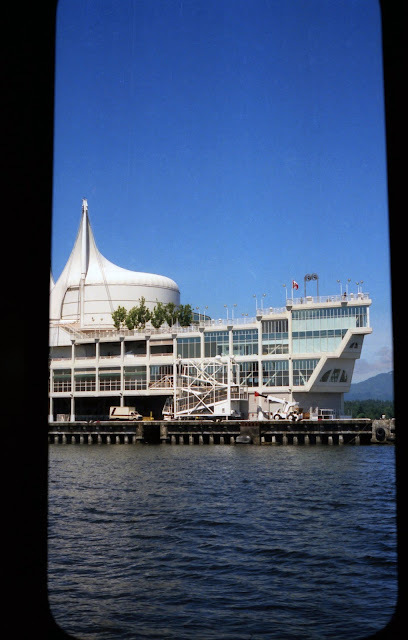 We were on the ferry to visit North Vancouver. It was a good trip! So you pretend Canada Place is the prow of some fantastic ship. There's several desks. The lowest deck the farthest forward with big picture windows is where Steven's office was, more or less. Where the photographer is in the picture, there are orca whales now (not in 1991, though, too much rotten stinkin' pollution!). Steven ruptured his ankle or broke his knee or something like that in Canada Place, though, so the stairs are treacherous. That, and if you turn 180°, you'll see the Port of Vancouver and their nasty chlorine spill. We're all super lucky the prevailing wind went the other way and that the fire department was able to contain the mess quickly.